The process of coming to terms with the past has gradually been replaced by the wish to preserve the past. It begins with the conclusion that guilt never ends and the damage is done. There is no reparation or reconciliation, only solidarity in remembrance. As a local organization of the Mauthausen Committee Austria (MKÖ), we remember the hundreds of Jewish and other victims of the Nazi regime who were put to death in the ex-forced workers’ camp of Liebenau, Graz, Austria. By preserving the memory of these horrible events and carrying on the public debate about this topic, we endeavour to link the past with the present. The Declaration of Human Rights issued by member states of the United Nations in 1948 was the first reaction to the horrors of World War II and the Holocaust. More than seventy years after these crimes were committed, we advocate the construction of an adequate memorial place and museum to demonstrate the dimension of the “Camp Archipelago Liebenau” for around ten thousand forced workers in today’s residential area Grünanger. We demand that archaeological research be done in search of crime victims to avoid that social housing is built in the vicinity or on top of burial sites. 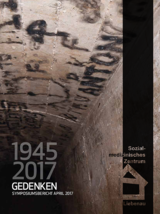 We demand that contemporary historical research be launched to broaden the scarce knowledge about the life situations of inmates and about the crimes committed by perpetrators for the Nazi administration of Graz and the Steyr-Daimler-Puch works. We speak out against any belittlement of Nazi crimes and against discrimination, racism, and antisemitism in all its shapes and forms. To this end, we address the public, organize events and cooperate with other organizations and institutions of education. The thousands of Jewish men and women who in April 1945 were driven on death marches from the Hungarian border through Graz into the CC of Mauthausen. In 1947, the corpses of 53 victims were recovered from a mass burial site at the Grünanger near the river Mur, murdered by Werkschutz and SS. In 1992, two victims were found during the construction of the kindergarten in Andersengasse. The burial sites of countless other victims are still unknown. The thousands of Russian prisoners of war who reached Styria in 1941. Most of them were killed by withholding them food and/or medical treatment. The number of victims buried near the “Russian Camp” (Freizeitzentrum Auwiese) is still unknown. The thousands of slave labourers from all over Europe who were kept imprisoned at the Grünanger, at Neudorf camp, at the forced workers’ camp of Thondorf and at the “Russian Camp” and/or forced to work for Steyr-Daimler-Puch. The women who underwent forced abortion in the camp of Liebenau and at the Graz Women’s Hospital or were exposed to other cruel medical experiments. 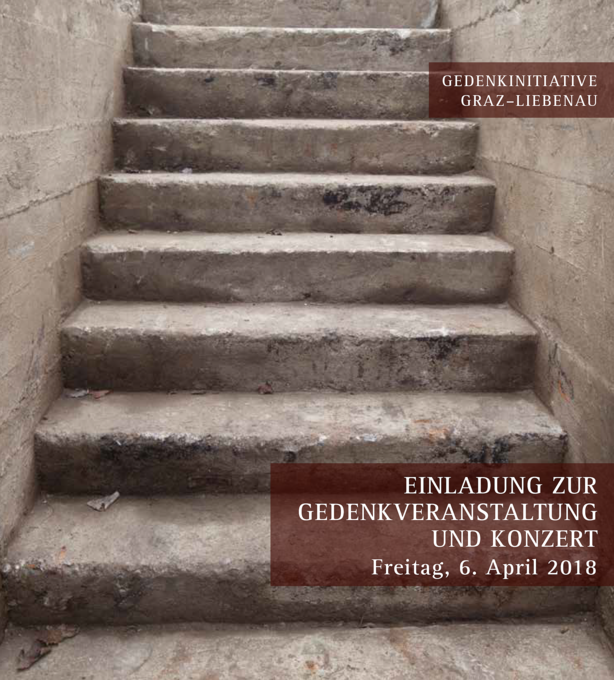 This event is organized with the support of Mauthausen Committee Austria, of the “Grünen” Delegation to the Municipal Council of Graz, of the “SPÖ” Delegation to the Municipal Council of Graz and the Cultural Office of Graz. The killing of around six million of Jewish, Roma, Sinti, homosexual, handicapped people must not be forgotten. The least what the following generations can do is taking responsibility and ensure restoration of historical memory and dignity for the victims. Never before has the Austrian Freedom Party FPÖ been infiltrated by student fraternities (Burschenschaften) as strongly as today. Out of 51 delegates to the National Assembly of Austria, 17 are members of German-national associations (33 per cent), among them five out of nine governors of Austrian provinces. They hold an absolute majority in the party executive of the FPÖ. Austria is said to be home to 4,000 German-national frat members (26 January 2018), experts count 150 corporations and other groupings. Traditional strongholds of these fraternities are the two university cities Vienna and Graz. The importance of linking history with the present day is evident when considering the hatred, agitation and extremism that is no longer only found in the right-wing margins but meanwhile at the very heart of our society. Extreme-right printed media, such as the “Aula” magazine, right-wing frat members and, increasingly, politicians at the national and regional level have lately contributed to making anti-democratic, xenophobic and antisemitic thoughts socially acceptable and are slowly beginning to undermine democratic core principles. Therefore, events of remembrance are here to enable people – and especially young people – to discuss the past, urging us to stand up against antisemitism and extremism in any form. Graz is the organisational centre for the death march of Jews from Hungary. The first transport of Jewish men and women to the Camp of Liebenau took place at Easter 1945. 7,000 to 9,000 people were driven toward Mauthausen; a total of 7,000 on 4th April alone. Hundreds of them were murdered in Graz and rapidly ‘buried’ in bomb craters. Sale of the premises to the City of Graz “with all legacy issues”. Accommodation for German refugees, later hut barracks for the poor. “Liebenau Trial” and exhumation of 53 victims. Involved in the killings were Gestapo, SS and Werkschutz of the Puch works. Three perpetrators were sentenced to death and executed, no further trials took place. During the construction of the municipal kindergarten at Andersengasse 49, two victims were recovered within the “lager premises” under strictest secrecy and autopsied by forensic medicine. No other legal measures followed. No information about the whereabouts of the bones was provided. Publication and dissemination of the research results from 2003 regarding the “Liebenau Trial” by Univ.Doz. Barbara Stelzl-Marx on occasion of the planning of the power plant on the river Mur. Start of our own research on site with access to and photo documentation of the NS cellar at Andersengasse 32-34. Multi-temporal analysis of aerial views (aerial view database Dr. Carl) with localisation of possible mass burial sites. We transmitted this documentation to the Federal Monuments Office (BDA) as a basis for further measures to be taken by the BDA. Archaeological peer opinion by Univ.Prof. Claudia Theune-Vogt, Dean of the Faculty of History and Cultural Sciences (unpublished). Aerial photogrammetric opinion, Dipl. Ing. Fuxjäger / ADP-Rinner, localisation of suspected areas to the nearest 50cm. Documentation of remainders of two opened and cleared bomb craters (Wiki-Jugendzentrum, former Konsum market). Declaration of the Grünanger and the area between the Petersbach river and the Seifenfabrik (including its premises) as “archaeological site”. Cellar in Andersengasse 32-34 listed by the BDA as “historic site”. Archaeological excavations conducted as part of the construction site for the power plant on the river Mur. Extensive camp structures were uncovered in this process (bunkers, barracks foundations, finds, graffiti of victims and/or perpetrators). Bunker premises with graffiti listed by the BDA as “historic site” (meanwhile built over with a youth centre). Barbara Stelzl-Marx, Der „Liebenauer Prozess“: NS-Gewaltverbrechen im Spiegel der steirischen Nachkriegspresse, in: Verein zur Förderung justizgeschichtlicher Forschungen und Verein zur Erforschung nationalsozialistischer Gewaltverbrechen und ihrer Aufarbeitung (Hg), Justiz und Erinnerung. Nr. 7/ Februar 2003, S. 2-12. Barbara Stelzl-Marx, Das Lager Graz-Liebenau in der NS-Zeit. Zwangsarbeiter – Todesmärsche – Nachkriegsjustiz. Graz 2012.